Min Child AgeAny age, babies welcome! Captain Barend Chapman originally from Cape Town South Africa, graduated from university of UJ as a Engineering Metallurgist and later obtained his Production Management Diploma. He worked for De Beers in the Synthetic Diamond Division for some thirty years. He sailed, snorkeled and deep sea fished from off the Mozambican coast, Sodwana Bay and St Lucia coast of Natal South Africa, Port Alfred (Eastern Cape) and most of Western Cape. For the past Six years him and First Mate Teresa pursued their dream of owning their own Yacht and becoming full time sailors. Their Circumnavigation started in December 2014 when they took part in a Governors Cup Yacht Race from Cape Town to St Helena. They cruised Brazil´s coastline for six months, French Guyana river water ways and coastline for Five months and there after sailed on to Grenada and Caribbean. 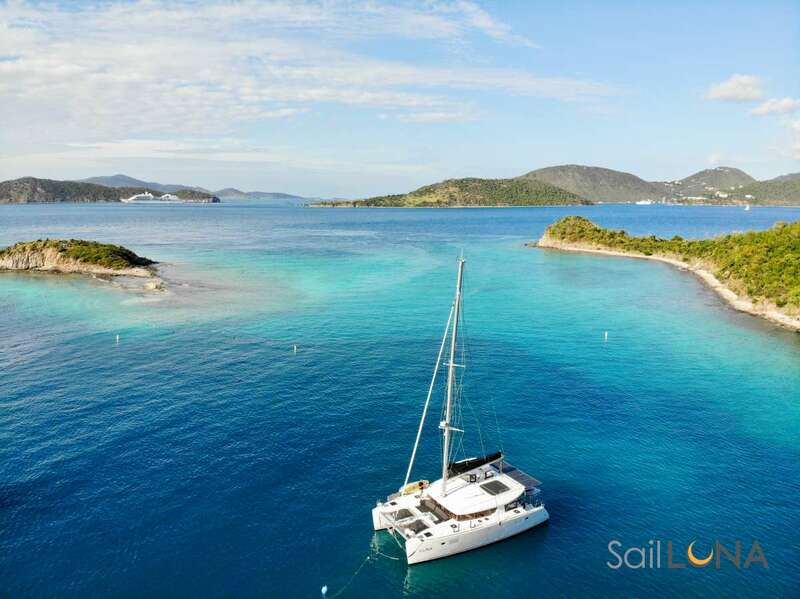 They fell in love with USVI/BVI and decided to stay, they are now in their second charter season in the BVI and USVI. First Mate Teresa Chapman, a Customer Service professional from Cape Town South Africa who shared Baren´s dream can not wait to welcome you on board Entheos. She loves to entertain and to prepare meals to each and every person´s satisfaction. Her motto is to make you feel special, relaxed and to share the beauty that the BVI and USVI Islands have to offer. Boat is family friendly and LOVES to have babies aboard! Offer: Entheos offers $250 off for each child age 12 and under at date of charter start, not at date of booking. Limit of 2 per charter. Offer will be prorated for 6 nights charter. Send us an inquiry to get specific pricing for Entheos. We appreciate you taking us for round two. Shannon had a fantastic birthday. Meeting foxy was an amazing surprise! Dinner, drinks and dominoes was a lovely activity to cap each fun filled day. We floated with Patricia and Deloris, sang songs in White bay and ran away from a huge Baracuda. Thank you for all the memories. Thank you so much for the most relaxing and enjoyable vacation!. Memories to last forever. We enjoyed every moment. The food was delicious and the evening drinks and stories were all wonderful. Words cant express our gratitude - you put in a lot of planning to make sure every aspect was taken care of. The history of the islands and the reef viewing were favorites, our questions regarding sailing were invited and answered with years of experience. The crew was most definitely friendly and accommodating from the very beginning to the very end. The yacht was very clean and comfortable. Everything is well cared for. The boat was well ventilated, so glad it did not have air-conditioning as there is enough natural cooling from the water and winds. Every meal was delicious. The food was presented in a lovely manner which made the experience more delightful. We loved the area we sailed in - so beautiful! Bertie and Teresa are very gracious hosts and did everything to make sure the trip went well. The food and drinks were awesome! The evenings were filled with enjoyable conversation and sailing stories while watching for sea turtles or other wild life. We appreciate their watchful eye while we were snorkeling or paddle boarding to ensure our safety. They are very familiar and knowledgeable with the area which allows for a wide variety of activities. All in all, a truly memorable and relaxing vacation. The week passed too quickly! Definitely recommend Bertie and Teresa. We certainly will book another trip with them. This ends our beautiful time together. I will never forget the blue and turquoise water, the pink sunsets and your hospitality. You two are genuine spiritual gifts. May the wind always be at your back, your guests appreciate your cooking and stories, may your beer always be cold and may you never run out of ice. Thank you so much for providing us with the trip of a lifetime. All future vacations will be compared to this one and it will be hard to live up to the amazing experience we had on Entheos. Bertie and Teresa you are both professionals and a joy to be around. The food that came out the kitchen was incredible every time!. Also the best Painkiller in BVI! Thanks again for welcoming us onto your boat. Thank you so much for an amazing trip on Entheos, you two made every minute memorable. Thank you for showing us the beautiful BVI. We will be back for sure! You guys are superstars! Peggy and I cant say enough about your hospitality, willingness to go the extra mile to keep us happy and well fed!. I even had to loosen my belt by two notches, which says everything!. This was a great weak, our time on Entheos was top of the pile! Looking forward to seeing you again. Thanks so much you guys! It has been a wonderful week of fun in the sun, snorkeling, many laughs but above all else, making a new friendship. It is great to meek like minded adventurous folks who have cut the ties to head out into the world to seek new experiences. I will fondly remember our time on Entheos and really appreciate your effort made to make this trip extra special for my mom´s 70th birthday celebration. Thank you again for everything, we had an amazing time. The food was out of this world, the company even better. You guys are wonderful amazing people and we enjoyed ourselves very much. Thank you for showing us so many amazing spots and teaching us a new game. You made us feel so at home, words cant thank you enough. The crew was extremely friendly, the yacht was comfortable, clean and well ventilated. The food was well presented and what Teresa can cook on this boat is amazing. We liked the area we sailed in. This trip was like no other. These two people really enjoy what they are doing and are very hospitable it was like hanging out with family. We left our trip in there hands and couldn´t have asked for more from the time we boarded they made sure we were comfortable and had everything we needed. Bertie always made sure we sailed in good conditions and watched out for us. Where do we even begin. This has been such a great experience and trip. We had so much fun with you two!. Everything was perfect, every single part. What a great way to close out 2018 and start 2019! We really cant thank you enough. The sail, the most amazing food and presentation. Painkillers on land, every excursion, games at night. You have turned this boat into a home and thank you for sharing it with us!. This is not good bye - we will see each other again. So many words and ways to express thanks, but they all seem inadequate!!. We have all been looking forward so much to our first family vacation together in four years. So, our hopes and expectations were very high - and the reason we chose to finally do what we have been telling Julia and Joanne about for years - sailing in the beautiful Caribbean! !You made our trip and experiences and the time together so much more than we had ever dreamed it would ever be! The list of wonderful memories we will take home with us is endless and precious. Teresa, i think we may all be taking home a few extra pounds too!. You are an exceptional and inspirational chef!!. You both have a special calling and gift, to put your guests in a wonderful holiday mind set. Just lovely and pampered the whole week. Thanks and many thanks again for a happy, happy family time together. Thank you so much!. This was our dream honeymoon. We couldn´t have asked for nicer or more knowledgeable people to take us exploring. You guys are awesome. We hit all our highlights and then some we will never forget, Bertie´s stories and the fun we had together. An experience we will keep forever! A true treasure of a holiday for our family!. You have made it so relaxing, shown us so many fabulous places that it made it impossible to choose a ´favorite place of the day!´. It really has been such a special family time - to switch out of the hectic pace of life and enjoy time together. The food was delicious and we always felt looked after - so THANK YOU!! for a magical holiday! I loved the trip seeing turtles and dolphins. Have a wonderful time chartering new people, keep making great breakfast and Bertie - STAY funny. Thanks for the game nights, we will have lots of fun. Love - Lily (Your favorite) 10 Years old. Its Zoe, your favorite person ever. I am so, so sad that this week is over. I had so much fun, I especially liked seeing the dolphins and turtles, snorkeling with the scuba divers. I will miss you both. Thank you for a fantastic week. While the location and your yacht are both awesome, what really made the holiday was you two. Your warmth, friendliness, fun and kind spirit made it impossible not to have a great time. Thank you once again. What a wonderful few days it has been - to few in fact!. Its been a delightful surprise to find what feels like 2 old friends down here in the BVI. Thank you for welcoming us with open arms aboard your fabulous boat. Teresa, the food you managed to make three times a day rivals 5 star restaurant anywhere!. Bertie, your explanation of all the things to see and your knowledge of just the right thing to do is spot on - thank you! The stories told and memories shared have been so much fun. Awesome trip with awesome people. We will be back! From the start of our trip on Entheos to the last day, we had the vacation of a lifetime. Teresa and Bertie are some of the nicest, hardest working people you will ever meet. Entheos is kept extremely up-to-date and very clean. It’s great that it has a separate living area for guests and a private head with dedicated shower. We felt like we had our own space which was unexpected and really appreciated. Captain Bertie is highly skilled and made us feel extra safe as we made our way around the BVIs. He keeps an eye on the weather and other conditions and makes recommendations to make sure you get the most out of your time on their boat. For our trip, it was extremely windy so we had to change course a bit but Bertie make sure we were always safe and having a great time. Teresa’s skills in the kitchen are top-notch. Every meal she served was delicious and fairly healthy (per our special request for healthier options). She will serve meals at your schedule, so it’s great to have that flexibility as we are late risers. And, again, unlike other charter options, Teresa is also flexible to your dietary needs as long as you communicate them to her prior to the trip. She is also a fantastic bartender, serving up frozen margaritas, painkillers, rum punch and champagne! We got to visit several great islands during our 5 days on Entheos with activities including snorkeling, swimming, visiting cool bars/restaurants, island sight seeing, etc. We did not choose to do any diving, but they offer that as an extra cost option. Basically, all we had to do was sit back and relax, and our hosts took care of seeing to it that we were having an amazing time. We look forward to sailing again on the Entheos. What was a “trip” turned into a magical experience and hopefully lifelong friends in Teresa and Bertie. Well, we could never have hoped that our second charter with you guys would rival the last but it did!!. You went out of your way to show us new and gorgeous spots and planned another great itinerary. We really felt like friends back to see friends rather than just a charter. You are such a special couple, so much fun but also so good at what you do. Teresa, you would win any boat cooking challenge. The food was awesome and Bertie we felt 100% safe all the time with you skippering and guidance. Thank you for hosting us and all the hard work. We are looking forward to charter number three. First time we did something like this, we came of course with expectations. Now after our holiday we can say it was in ALL WAYS better than we thought it would be. Your offer/package is awesome. The places you took us to, the information you shared with us, the food you prepared for us - really great!!. We enjoyed a relaxed family vacation witch was out of this world!! Thank you both so much for everything. Bertie and Teresa were fantastic!!! We changed our minds twice and wanted to stay on the yacht instead of going ashore for dinner. They completely understood and adapted to our request. We ended up having a fantastic ´happy hour´ watching the sunset, followed by a glamourous dinner under the stars. It was great how they could happily revise plans to what we felt like doing. They are two of the most kind and friendly people we have ever met. We told lots of jokes and stories. I cannot recall when we ever laughed so hard in one week. They always acted highly professional in everything they did. Bertie knows ´seamanship´ and is polite not only to his guests, but to other yachts as well. My husband and I were very comfortable in our cabin. The yacht was always impeccably clean. We even slept outside under the stars twice and watched the shooting stars and activity around on other yachts. It was an incredible experience. Bertie and Teresa also timed the cleaning so that they were ´stealth´. Whenever we came back from a snorkel we knew they had been working hard to keep it magically pristine! We kept the portholes of our quarters open all of the time and had the fresh sea air always moving throughout. We were cool and comfortable. This made for wonderful sleep every night and we would highly recommend the same. The fresh air and sound of the water just sings you to sleep. Teresa put her heart and soul into every meal. We have eaten at five star restaurants all over North America, and have never eaten such delicious meals presented so beautifully. There was always plenty to eat at the meals and food to snack on imbetween. We enjoyed coming back from excursions to find a nice cold drink just appear! Teresa studied our food preferences, researched creative menus and presented delicious food. The food was absolutely first class. This Captain really knows what he is doing. He made sure to select routing so that we had calm seas and very quiet and calm moorings and anchorages. Bertie´s experience in the area provided perfect timing for the entire week. They showed us everything that we wanted to see and more. Our expectations were high, and Bertie and Teresa exceeded them. Virgin Island Sailing was fantastic. Thank you for arranging the revision in the dates which we needed. We highly recommend Entheos with Bertie and Teresa. They left us alone whenever we wanted, and joined us whenever we asked. Our day started with a morning swim, relaxing with coffee and conversation, and a fantastic breakfast. Then we explored new spots or moved to a new location. The paddle boarding was so much fun. They were great with selecting snorkeling spots fitting to our ability, and very beautiful fish. For those wanting adventure and hiking, they know where to go. Their flexibility to adapt to our changing our minds was fantastic. Teresa has many special touches and surprises that just make the week so much more of a ´one of a kind´ experience. We had the holiday of a lifetime and will never forget it. We left the week with two very good new friends and look forward to seeing them again. Thank you so, so much for your hospitality. Us and the kids truly enjoyed our time spent on Entheos. Thank you for Andrianna´s birthday celebration and the birthday cake. We are sorry we had to end our holiday so sudden due to family commitments back home. We will be back for sure. Thank you for making my 50th so special. You both went all out for us. You certainly know how to throw a princess party! Thanks for sharing you life and home with us. It was definitely a wonderful adventure. Steve and I thoroughly enjoyed our adventures on Entheos. We hope you enjoy safe travels where ever it may take you. We will remember our 5th anniversary and Valentines day fondly. We have been nurturing the dream of sailing in the Caribbean for years and you have been a major contributor for the fullfillment of this dream. We thank Neptune for the graces he sent towards us. We had good weather good seas and even a private show Starred by 5 dolphins playing left and right the bow for our amusement. Why was Neptune so kind? ?, probably because you have done your part by having all details carefully prepared and the whole trip professionally executed. It was a pleasure to wake up and have a creative and delicious breakfast waiting for us and be supported by Teresa´s patience waiting for Arthur to finish. Lunch and Dinner were never the same and surprised us all the time. Even the black coffee was prepared to Brazillian perfection. Entheos also did her part well, such a nice and new boat filled with the amenities and technology necessary to make our stay comfortable and safe, skippered by Captain Bertie who kept adjusting the course and the schedule always according to our best comfort and taking the most out of those beautiful Islands. Thank you very much for the best family vacation we ever experienced. You treated our family like your own and truly made for a fantastic Christmas new year holiday. We loved every minute of the trip, from the many pancakes to the 12ft swells the Baths, Caves, Bubbly pools the boys learning Afrikaans and Mexican train. Just having down time, being disconnected and spending quality time as a family. We appreciated your kindness and hospitality and will continue to stay in touch as we met fantastic new friends. Cheers to 2018!!!! Bertie and Teresa, Thank you so much for your hospitality We´ve enjoyed our vacation tremendously. It was the most relaxing time we had in forever. Thank you Bertie for being the best, the most knowledgeable, the most generous captain ever. You made our trip easy and fun. Thank you Teresa - you are the best hostess, captains right hand, chef, bartender and medic ever. your food is the best we ever tasted. We were comfortable, well fed and always happy. Bertie and Teresa. WOW! What an amazing experience. This will go down as one of the best family vacations ever. You two were exceptional hosts, from the food , drinks, adventures and always making us feel comfortable. We can not say enough, we can only hope our adventures cross again.. Thank you! Thank you! You two are absolutely amazing. We had the best honeymoon thanks to you. We loved every moment of the trip and all the little details - from place settings to stickers on toilet paper. Every thing was amazing. We hope to sail with you again and thank you so much for opening your house to us. You both are amazing hosts! Dear Bertie and Teresa, what a perfect trip!. We had such an amazing time and the two of you are the best hosts but also made the trip incredibly fun. It truly felt more like chartering a boat with a couple of friends. I am sure more for us than for you since we had no cooking, cleaning to do. You made it seem effortless so we could enjoy. We will really miss you both and feel that we leaving friends behind! We will be back. I had a great trip on the boat. I liked when we went to Watermelon Cay and the paddle boards. It was a great trip on the catamaran. Thank you so much, Love Lillian. Thank you for an incredible trip!. As you know we have been planning a BVI sailing trip for years and we coack and uld not have picked a better ship for our vacation. You two were the perfect hosts!. We loved everything, the food, the snorkling, the paddle boarding, the mexican train games, the conversation, the sailing - Everything!. Thank you to the extra attention to everything. Our 27th wedding anniversary celebration with lots of special decorations and Champagne. All the Rum punches just when we needed it. We can not wait to come back to see you two again. Thank you once again for an incredible adventure and all you did to make it VERY special for us. The best part of all is that we now have two new friends!! Bertie and Teresa! I had a wonderful time and enjoyed the trip immensely. I think my highlight was the snorkeling, the caves, the bubbly baths, the early morning swims and so much more. I appreciate all the amenities and OMG the meals, yummy. I enjoyed being under sail, so peaceful!. If you see a turtle with specs, tell him he can keep it so he can see me coming!. Teresa and Bertie. Thank you for a wonderful few days, you are the best hosts. I will send friends and family your way. I really enjoyed your company and our conversations. Cheers! Thank you! Thank you for hosting a memorable event. Good food, good conversation and good accommodation. The spots you took us to was very well selected and seemed to be the most popular spots on the Island. Thank you both, it was a pleasure meeting you. What an amazing four days on Entheos, you two were the perfect hosts and couldn´t have imagine anything could have been better... And as we learned, EVERYTHING is better in the Caribbean. Thank you for sharing your home with us and making us feel welcome. See you again!!!!!! Ann - Dear Bertie and Teresa, Thank you for a fantastic trip and sharing your boat and lifestyle with us. We had a great time and we will definitely return for a longer trip in the future. Teresa, you are a fantastic cook, you amazed us with all the wonderful meals. Bertie, your hosting, knowledge and sailing skills are impressive!!!! Dan - Thank you for a Fantastic adventure. These last two days have been the most enjoyable part of our vacation. We are looking forward to staying in touch until we can come back for another trip. We had the best father son time possible. We got a weeks worth of paddle boarding, sailing, snorkeling and great meals and times in only four days. The hospitality and friendship shown by you was first class. Thank you for a trip we will not forget. See you soon. Blew away expectations. Was VERY impressed with every aspect of the food. I could not have asked for a better experience. Bertie & Teresa were beyond amazing. They are natural hosts who genuinely went above & beyond over and over again to make sure that my girlfriend & I had an unforgettable vacation. A few things that I found particularly enjoyable: Food: The food was incredible. Perhaps my expectations were too low going in but I was routinely impressed with the quality (& quantity) of Teresa´s meals. Outstanding. Hospitality: Teresa & Bertie were the ultimate hosts. They did all the little things to make sure that we were enjoying ourselves. Two of my favorite were: 1) There was a welcome tendency for a delicious frosty drink to show up at just the right time every day, never even had to ask. 2) They took a TON of photos throughout the trip & gave them to us at the end. It was so nice to be able to just enjoy a trip and not worry about capturing it (but at the same time wanting the photos for the memories). Knowledge/Safety: Couldn´t have felt safer than with Bertie at the helm. He does a great job of encouraging adventure but making you aware of the surroundings. I could not possibly give them a strong recommendation. You will not regret picking Entheos for your trip! Sean - Our family had a wonderful time!! !, Bertie and Teresa were fabulous. The sailing, tour guiding and food were professional quality. They are both super friendly. We really enjoyed their company. Meals were one of the unexpected highlights of the trip, meals were ample, delicious and professionally presented, with Teresa handling everything and us just showing up to eat. They also prepared great mixed drinks in the evening. We just want to reiterate that Bertie and Teresa were truly great hosts, knowledgeable, professional, friendly and fun. They felt like extended family members by the end of the week joining us in conversation, games etc. Karin - Dear Bertie and Teresa, What can we say, this has been a true dream vacation. We can´t imagine a better way to have explored the BVI. You have been amazing hosts and we will fondly remember your warmth and sharing in our silly humor. Teresa, your cooking is fantastic! (I don´t know how you pull it off) the elaborate feasts!!!!. We have just had a superb experience sailing the BVI on Entheos. My husband and I and our two kids aged 8 and 5 had high hopes for this holiday and they were exceeded on every level. The beauty and serenity of the islands, the weather but most importantly our hosts made us feel so welcome. I was worried about how it would be with the kids but Bertie and Teresa couldn´t have been more accommodating. They tought my son how to play dominoes and to steer the boat. Teresa was so sweet with my daughter, bringing little craft activities and toys for her to enjoy during quiet time. We were never bored for a minute. We snorkeled, hiked, swam, beachcombed, paddle boarded, relaxed and star gazed. I have no idea how Teresa prepared the lovely meals she did and she kept the boat spotlessly clean. We are coming back next year!!! Wow!!! The only thing that surpasses the beauty of the BVI´s, is your genuine kindness and hospitality! Entheos is so appropriately named with you all as Captain and 1st Mate! Please, Please come visit us in Charleston anytime. While my wife and I were preparing to sail across the Atlantic from to Cape Town we were delighted to be introduced to another couple who had already cruised across to the Caribbean. We subsequently found out that besides being sailors they were planning to charter their vessel out to interested clients. We were therefore thrilled when Theresa and Captain Bertie invited us to dinner on-board another yacht very similar to what they own and operate in the Caribbean. Upon arrival we were met with a classic pain killer cocktail served by the hosts on the outside cockpit area. All one can say is it was delicious , thirst quenching and if one had any pain it would be dispelled immediately. Accompanying the arrival drinks was a wonderful selection of snacks and home-made delights all of which were served by our hosts who made us feel like royalty. The dinner consisted of an oxtail and chorizo stew that had been prepared in a very energy saving manner using thermal insulation to store it overnight after initial partial cooking. This was served with a variety of fresh vegetables, potatoes and rice all of which had been prepared with a focus on flavour. Our desert was a deconstructed Eton mess type meringue with delicious berries. The home cooked nature of the meringue was deceiving as they were perfect despite all being prepared in the smallest of kitchens (galley). During the meal the guest were kept well watered with a robust selection local wines. After dinner drinks were served including a T & B special called chocolate cake again the content could be considered flammable but absolutely delicious. So all in all if you get the opportunity to sail with this lovely couple be prepared to enjoy the culinary delights emanating from the galley along with friendly and welcoming hosts. This is a must do holiday !! Dear Bertie and Teresa. Well we would never have hoped that our second charter with you guys would rival the last but it sure did!!. You went out your way to show us new and gorgeous spots and planned another great itinerary. We really feel like family back to see family rather than just a charter. You are such a special couple, so much fun but also so good at what you do. Teresa - you would win any boat cooking challenge - the food was awesome and Bertie we once again felt 100% safe all the time with your skippering and guidance. Thank you for hosting us and all the hard work. We are looking forward to charter number three. Fresh fruit, yogurt, juice coffee and tea available daily. Chef´s choise of pancakes, waffles or french toast.